This afternoon, Viaje has taken to the social media airwaves with a couple of imminent releases coming down the pike – the Viaje Chicharrones and Jalapeño. First up is the Chicharronnes, produced at the TABSA (Fernandez) factory. The line will be available in three different “flavors” – Original, Bold and Spicy. The differing blends respectively feature Corojo, Maduro and Criollo wrapper leaf. Per the posted caption, all tobacco in the line is “grown and raised on AGANORSA farms in Nicaragua. 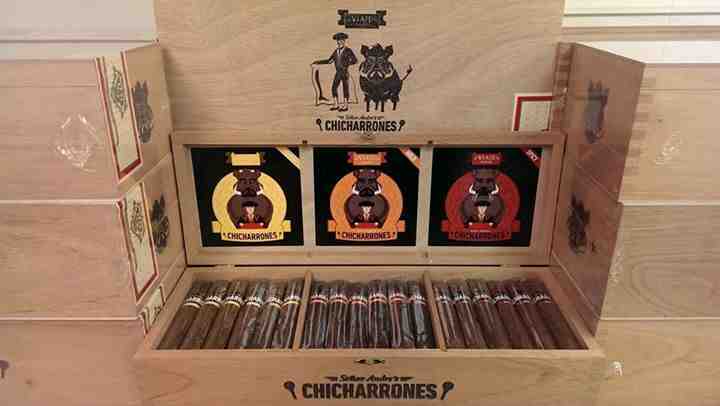 Each box will contain 90 Chicharrones, which will be 4.5” x 48. Both lines will be shipping March 16th to all authorized Viaje retailers. *I failed to take a pic of tonight’s 6.25″x52 torpedo, so enjoy this picture of a giant stick made by my buddy Arnold! 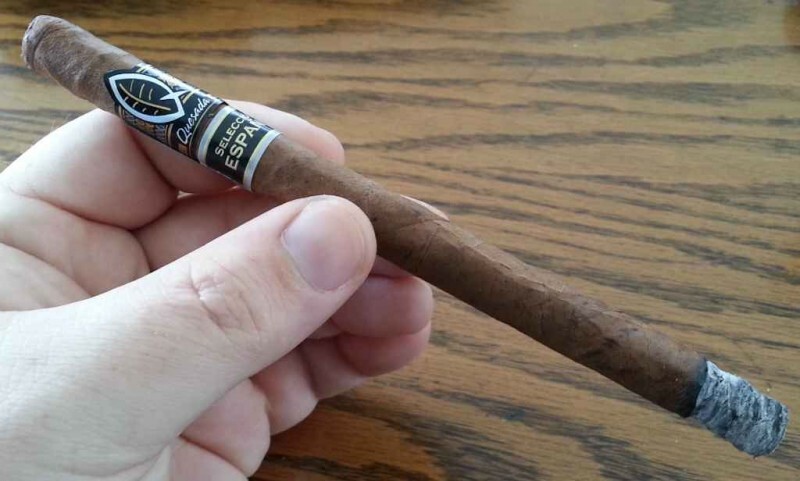 Welcome to Episode 101, featuring our 20th Unbanded cigar, suggested by listener Steve McHenry (Thanks Steve for the submission…tune in to see how it went!). This Unbanded was a bit of a surprise to both of us at the grand reveal. I don’t believe either of us had any familiarity with the cigar, and I think it shows :). Give a listen and find out what this 6.25″ x 52 beauty turned out to be! Well, I suppose it had to happen some time. Christian Eiroa put up a pic this week for an 8”x80 behemoth coming from Asylum. Madness. The follow up to a cigar we’ve featured – the eccj from illusione – is out nationally. The eccj 20th shipped this past week. 6.25”x48 with Nicaraguan Corojo 99 wrapper over Nicaraguan Criollo 98 & 99 fillers. 15 count boxes with an MSRP of about $12/stick. HB1590 in VA looks to increase various tobacco taxes, including an increase from 10% to 60% of wholesale on cigars! That will basically make Virginians’ $10 cigars jump to $15! It includes several other complex increases on loose tobacco and cigarettes, but I knew a healthy number of the audience calls VA home and would want to know they’d better contact the reps…. **UPDATE** Virginians dodged a bullet. This bill was tabled on Wednesday, which effectively kills it….for this session. I little doubt it won’t resurface soon. In what’s a clear pattern with Crowned Heads, they have another LE coming soon. Some time between Feb-March, they’ll be releasing a 6×38 petit lancero called the Single Action. It will be an extension of the JDH Reserve line, and only have a production run of 2000 boxes of 10. MSRP is at $9.25/stick. Brazilian Aripiraca wrapper over Ecuadoran Sumatran binder and Nicaraguan fillers. While I’m not a huge Viaje fan in general, I do love their SuperShot series, which hasn’t been shipped since 2013. Well, it’s coming back and will be shipping to retailers this week. This time, there is no Corojo version; only the Criollo. It comes in two sizes: the 10 Gauge (3.5”x54) and 12 Gauge (3.25”x52). I’m a sucker for the shotgun shell box-packaging on this line as well as the cigar itself…. It worked. I put the tobacco in a canning jar with the cap of water after s few days the water was almost gone but the tobacco was the same. I think I was humidifying the air. I moved the tobacco to s much smaller Tupperware container and put another cap of water inside. After 4 or 5 days the tobacco was back. Moist and holding together somewhen I squeeze it but not completely sticking together. I’ll light it up during tonight’s show to be sure. 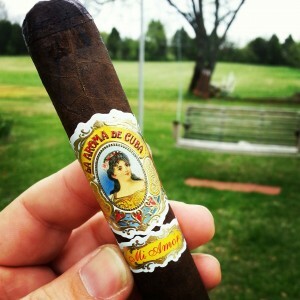 Next episode we will be featuring one of Craig’s favorites as our Cigar of the Week – 2005 Vega Robaina Farm Rolled. Be sure to tune in next week [monitor our Twitter/FB feeds for exact time this week; I’ll be traveling and unavailable during normal recording time]. If you would like to contact us in the meantime, you can reach us via the “Contact Us!” tab at the side of this page, or at the following emails: [email protected] [email protected] Please feel free to drop us a line if you have any questions you’d like answered, comments to make…or even compliments and complaints. We love to get your emails! Also, remember you can always go back and listen to previous episodes, which can be found in the Half Ashed Archive. You can download this week’s audio directly below (right-click “Download” and save), find us on iTunes, or subscribe with any podcast app at our RSS Feed. Video, as always, will be available at the Half Ashed YouTube Channel. P.S. – If you have unbanded suggestions or contributions, you can get those to us by sending an email [email protected] This email address goes directly to my wife, so you can simply suggest an unbanded cigar for her to source, or send me an email to [email protected] if you have something you’d like to send in. I will provide an address to send them. Thanks! Greetings, everyone. Welcome to another episode of Half Ashed. 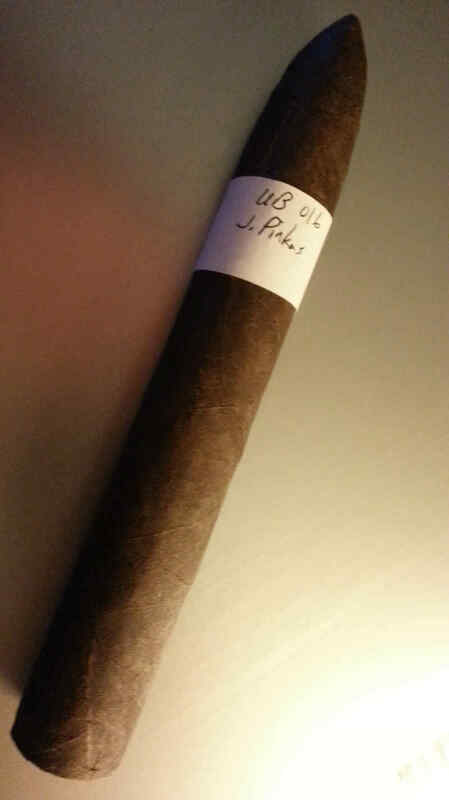 This week, we’re smoking Unbanded #016, supplied by Jacob Pinkas (thank you, Jacob!). Here are a few details from the show…. 1.) We have a forum again! We are up and fully functional….a single sign-on for the website, chat, and forum, and full Tapatalk integration. Feel free to jump over and leave some chatter! 2.) This week’s news items included stories from Tatuaje concerning the next TWO years’ Monster releases, Viaje’s “Collaboration Series,” Torano, AJ Fernandez, Sotolongo Cigars, GAR and an interesting new program from Tobacconist University. 3.) Of course, we covered what we’ve been enjoying – or NOT enjoying – in and with the world of cigars this week. 4.) We wrapped up with a listener email from bigpete. Next week, we will be featuring Monsdales as our Cigar of the Week, so be sure to check back in next Friday night at 9:30pm EST on halfashed.com where you can catch us recording and participate in the chatroom. If you would like to contact us in the meantime, you can reach us through the contact page or at the following emails: [email protected] or [email protected] Please feel free to drop us a line if you have any questions you’d like answered, comments to make…or even compliments and complaints. We love to get your emails! Also, remember you can always go back and listen to previous episodes, which can be found in the Half Ashed Archive. You can download this week’s audio directly below (right-click “Download” and save), or find us on iTunes to subscribe. Video, as always, will be available at the CigFed Half Ashed Video Archive. I don’t normally post every item that comes down the pike in terms of new releases, etc. I save that for Half Ashed. But today, I caught a few items from Viaje’s Facebook page that intrigued me. I’m a fan of several of their cigars, and we all know their packaging is “catchy” to say the least. The first item is an addition to the ongoing “Zombie Apocalypse” thread that runs through some other offerings. 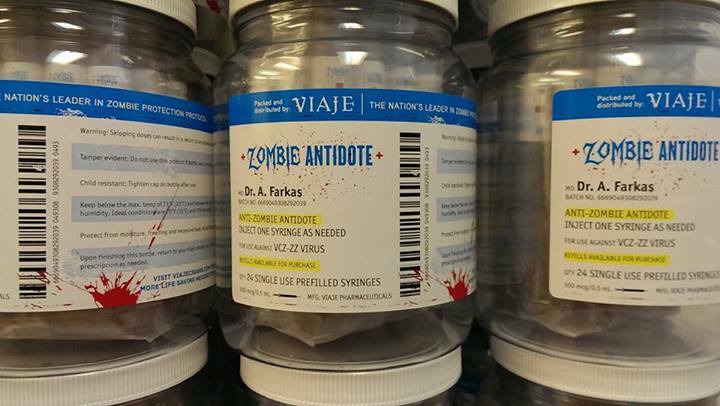 I suppose those who’ve been bitten by their earlier “Zombie” releases are now offered an antidote :). I thought the packaging was very unique….excited to see how the cigars themselves hold up. From what I can gather on the band, each prescription bottle contains 24 cigars and, of course, is renewable with further purchase. This addition was mentioned on an episode of Stogie Geeks (as summarized by Cigar Coop) earlier this year, but the packaging was not unveiled until today. I’m not one to really buy in to packaging….I don’t smoke the box, or bottle as it were, but I think this is a fun twist for the line. Based on the comment attached to the image, I understand these have shipped and should be on retailers’ shelves in the very near future. Secondly, again from Viaje’s social media accounts, news was released that the second release of the Viaje Roman Candle is slated around Independence Day. The behemoth 9″x50 Roman Candle was originally released in 2012. 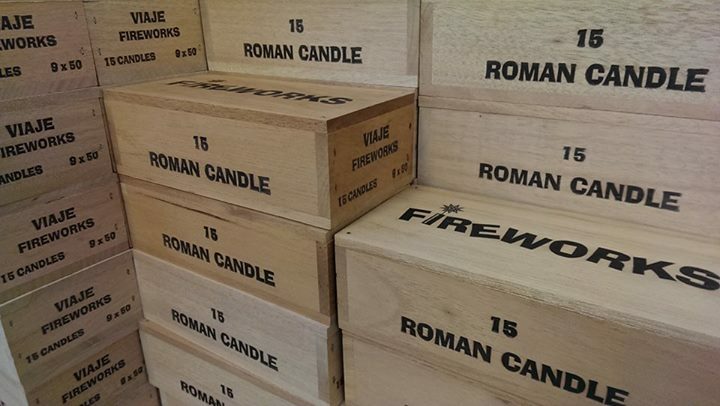 The current release will come packed in 15 count firework-crate boxes, much like the original. While not specified today, the original manufacturer for these was Raices Cubana and I will assume the same for this edition. 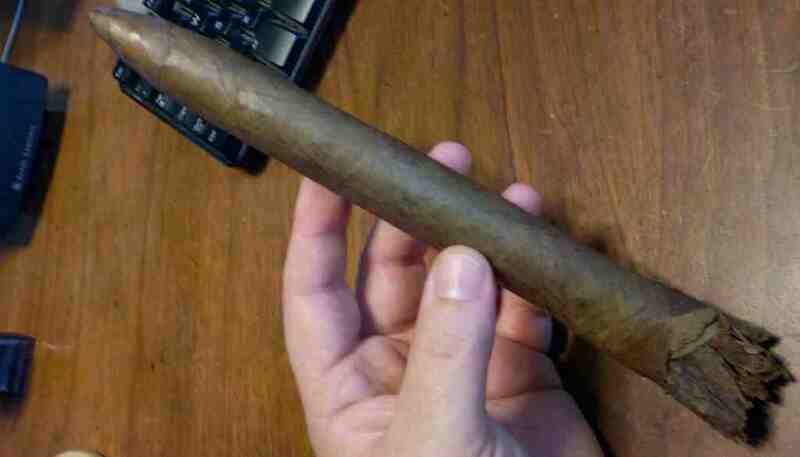 Personally, this cigar was a bit outside my normal range in terms of size, so I have no experience smoking it. But I’m in to give a go at the Zombie Antidote as soon as I get back down to my local B&M…. Good day, folks. I apologize for the late post; I’m still on the road until tomorrow. If you caught the show live, you’ll know that I was broadcasting from my parents’ garage in Tennessee. I’ll be brief for the show summary, and just tell you that we smoked the La Aroma de Cuba Mi Amor “Magnifico.” It is a delicious 6″X52 offering from Ashton (produced by My Father). Listen in to the show to catch our thoughts on it. 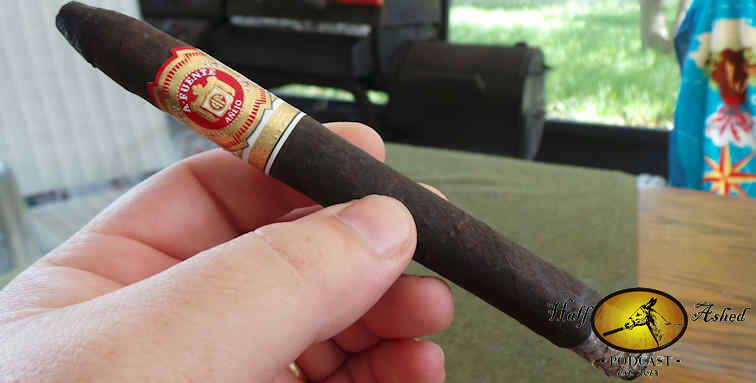 We had updates on previous stories concerning the Fuente Casa Cuba and Kelner cigar we smoked as the CoTW in Episode 061. In the news, we covered items from Viaje, Room101, Tatuaje, and Min Ron Nee’s upcoming 2nd Edition of “Illustrated Encyclopedia of Post Revolution Havana Cigars.” There were a couple of interesting tidbits in “what we’ve been smoking,” – notably, the Caucus houseblend from Georgetown Tobacco in Washington, DC. Finally, we covered a viewer question from the forum. Next week, our Cigar of the Week will be an Unbanded (#014) from Maria Elena Gonzalez – and we are super stoked about it. Be sure to check back in next Friday night at 9:30pm EST at Cigar Federation (details on locating the show will be on the front page that evening an hour before showtime), where you can catch us recording and participate in the chatroom. If you would like to contact us in the meantime, you can reach us through the contact page or at the following emails: [email protected] or [email protected] Please feel free to drop us a line if you have any questions you’d like answered, comments to make…or even compliments and complaints. We love to get your emails! Also, remember you can always go back and listen to previous episodes, which can be found in the Half Ashed Archive. You can download this week’s audio directly below (right-click “Download” and save), or find us on iTunes to subscribe. Video, as always, will be available at the Half Ashed Half Ashed YouTube Channel.